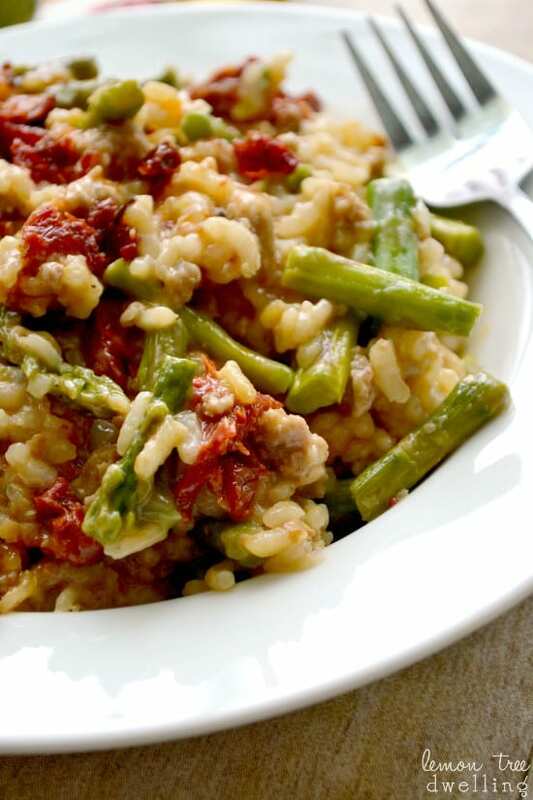 Just six ingredients and one pot is all you need to make this Creamy Risotto Recipe with asparagus, sun dried tomatoes, and sweet Italian sausage. 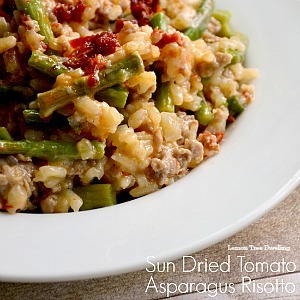 Such a delicious and easy recipe by Cathy at Lemon Tree Dwelling. Hello, 36th Avenue friends!! I am so happy to be back here with you today, and I am so happy it’s finally MAY!! Not only does that mean summer is well on its way, but May is the month of my due date! The countdown has officially begun. Of course, since my due date isn’t until the 19th….and since I have had to be induced 8 days late with all three of my other kids…..I am expecting a rather LONG countdown. Either way, though, our baby girl will have a May birthday and this will be the last month of my pregnancy! It’s funny – for months I have wanted nothing more than to just be done (I guess that’s what happens when you have three other little ones to chase around!) but now that it’s almost here, I’m okay with her taking her time. After all, life with four kids isn’t going to be easy! One of the things I’m most worried about? How in the world I’m going to get dinner on the table! 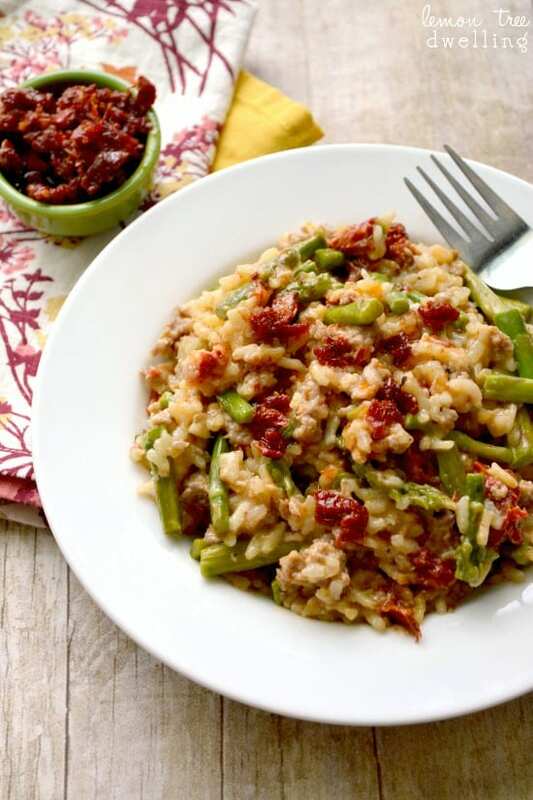 Which is why it’s great to have recipes like this risotto up my sleeve – one pot, six ingredients, and something the whole family will love! Because, quite honestly, I’m going to have more important things to worry about than what’s for dinner. I’ll just be sure to have the ingredients for this one on hand! Heat 1 Tbsp. olive oil in a large stock pot. 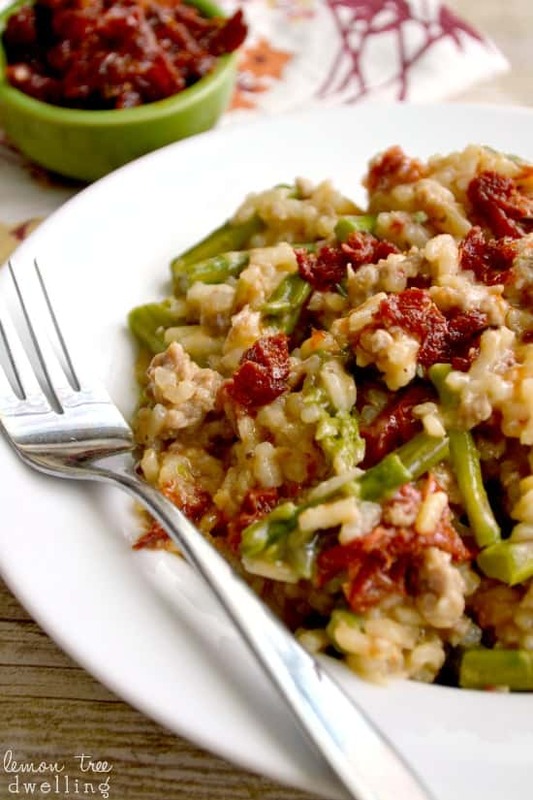 Stir in turkey sausage and onion; cook over medium heat until sausage is opaque. 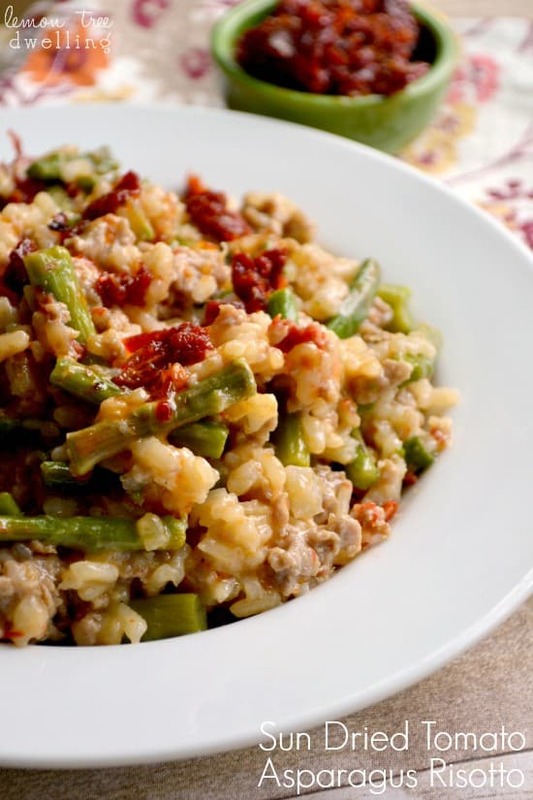 Add rice and stir constantly for one minute. Add 2 c. chicken broth and cook, stirring, until liquid is incorporated and no more liquid remains in pot. Continue adding chicken broth, ½ c. at a time, stirring after each addition until no liquid remains. 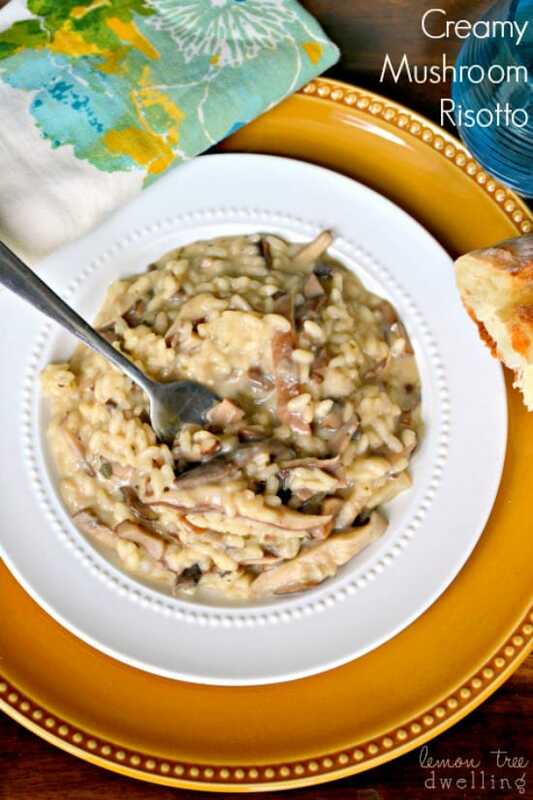 Once all liquid has been incorporated, remove risotto from heat. 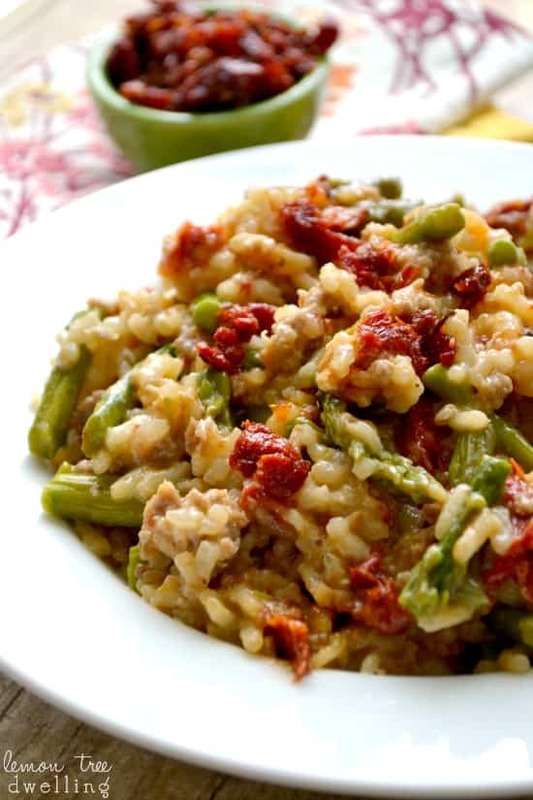 Add fresh asparagus and sun dried tomatoes and stir to combine. Serve hot with bread, salad, or on its own. Thank you so much, Desiree and friends, for having me here today! The next time I see you I’ll be sure to share pictures of our new little girl….until then, the countdown will continue!! 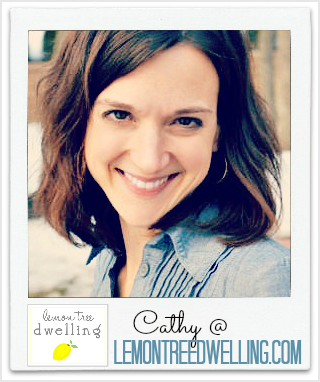 I’d love for you to stop by my Lemon Tree Dwelling and and say hello, and while you’re there, be sure to check out some of my other favorite dinner recipes! 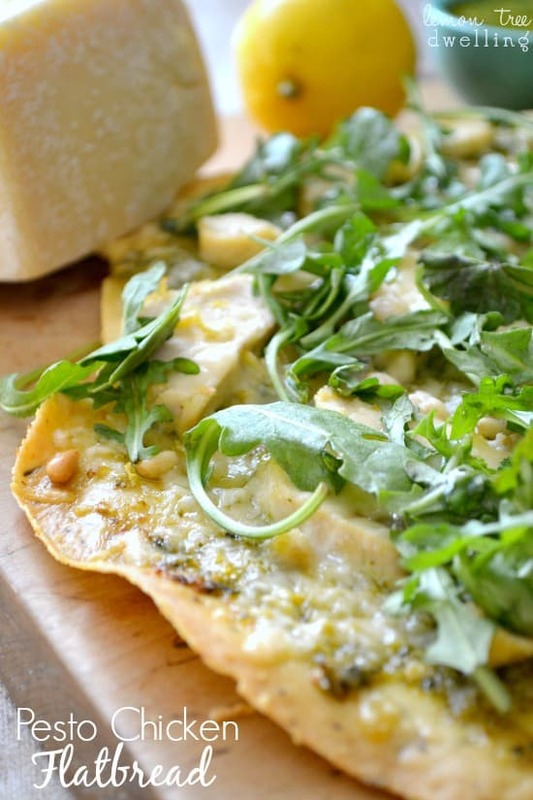 Click on the picture to view the recipe! This looks quite delish! Pinning this for later! That looks AMAZING!!! Oh boy- I want it for breakfast.